University of Belgrade, Technical Faculty in Bor will organize the 2nd International Student Conference on geology, mining, metallurgy, chemical engineering, material science and related fields – ISC2015 jointly with the Student Parliament of Technical Faculty in Bor. ISC2015 will be held at the Technical faculty in Bor, Bor, Serbia, on July 13 – 14, 2015. ISC2015 aims to promote scientific research of students of technical sciences from the country and the region, to exchange ideas and experiences, as well as interconnection and strengthening cooperation among university students in the country and the region. Along with the ISC2015 the Society of economic geology chapter at Imperial College London is organizing a research symposium and short-course on economic geology. ISC2015 topics will cover the following fields: geology, underground mining, surface mining, mineral processing, extractive metallurgy, metal processing, materials science, inorganic chemical engineering, environmental engineering, engineering management, recycling technologies, industrial engineering, energetics, manufacturing technologies, software engineering applications, mechatronics, machining, design and construction, and other related fields. 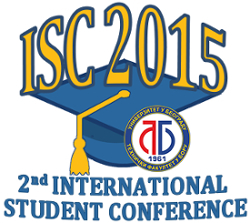 The Organizing committee kindly invites undergraduate and master academic students to submit their abstracts for ISC2015, according to the abstract template isc2015_template.doc, until June 1st to e-mail addresses vgrekulovic@tfbor.bg.ac.rs or sstojadinovic@tfbor.bg.ac.rs. Submitted abstracts accepted by the Scientific Board of ISC2015 will be published in Book of Abstracts. All undergraduate and master academic students have the right to participate, participation is free of charge. We welcome all students and wish them successful meeting!